Melt the butter in a pot, unite the minced shallot and lightly fry. Crumble the sausage, pour the product in the pot and add a little bit of hot broth. Perfume with the rosemary, add the salt and the pepper and continue the cooking. Unite the cheeses: the sliced Bagòss (without the crust) and the stracchino in pieces. Continue the cooking at moderate heat until the cheeses turn liquid. If it is necessary, you can add a little bit of broth. 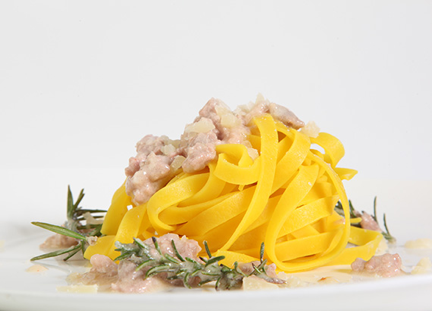 Add the saffron powder to the salted and hot water, cook the Tagliatelle and drain the pasta al dente.